Only $125 - Compared to $200 or more through a doctor! 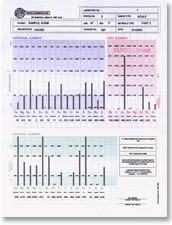 Test for toxic heavy metals and essential mineral imbalances - 12 page report. We also offer a personalized review of your test results to help guide you. Our most popular product. 100% pure bentonite clay with no added fillers or excipients. Buy 2 or more and save 15%! 100% pure and free of yeast, mold and bacteria. Totally safe and easy to use. Support your body's own detoxification processes with LipoCeutical™ Glutathione - advanced liposomal technology for maximum absorbtion. Attention Shoppers: Free Shipping on All Domestic Orders!! Welcome, and thank you for visiting our web site. We're very happy that you're here, because choosing to make a positive difference in your health is one of the most important aspects of life, and that's what we're really passionate about. We invite you to view our top-of-the-line health products and to call us or email us with any questions you may have. Our approach to wellness is based on the four cornerstones of healing: Supporting the body's normal detoxification processes, maintaining proper body pH, healthy diet with quality supplementation, and cellular protection. When these areas are addressed, balance is achieved, and the body is able to begin the self-healing process. We have helped over 70,000 customers worldwide maintain their health and well-being, and we look forward to helping you as well.